If you are trying to understand how a role works or if you are creating your own custom role for Azure resources, it's helpful to understand how roles are defined. This article describes the details of role definitions and provides some examples. * The wildcard character grants access to all operations that match the string. read Enables read operations (GET). write Enables write operations (PUT, POST, and PATCH). delete Enables delete operations (DELETE). Here's the Contributor role definition in JSON format. The wildcard (*) operation under Actions indicates that the principal assigned to this role can perform all actions, or in other words, it can manage everything. This includes actions defined in the future, as Azure adds new resource types. The operations under NotActions are subtracted from Actions. In the case of the Contributor role, NotActions removes this role's ability to manage access to resources and also assign access to resources. Management access is not inherited to your data. This separation prevents roles with wildcards (*) from having unrestricted access to your data. For example, if a user has a Reader role on a subscription, then they can view the storage account, but by default they can't view the underlying data. Previously, role-based access control was not used for data operations. Authorization for data operations varied across resource providers. The same role-based access control authorization model used for management operations has been extended to data operations (currently in preview). Here's the Storage Blob Data Reader role definition, which includes operations in both the Actions and DataActions properties. This role allows you to read the blob container and also the underlying blob data. Only data operations can be added to the DataActions and NotDataActions properties. Resource providers identify which operations are data operations, by setting the isDataAction property to true. To see a list of the operations where isDataAction is true, see Resource provider operations. Roles that do not have data operations are not required to have DataActions and NotDataActions properties within the role definition. Authorization for all management operation API calls is handled by Azure Resource Manager. Authorization for data operation API calls is handled by either a resource provider or Azure Resource Manager. To better understand how management and data operations work, let's consider a specific example. Alice has been assigned the Owner role at the subscription scope. Bob has been assigned the Storage Blob Data Contributor role at a storage account scope. The following diagram shows this example. Since Alice has a wildcard (*) action at a subscription scope, her permissions inherit down to enable her to perform all management actions. Alice can read, write, and delete containers. However, Alice cannot perform data operations without taking additional steps. For example, by default, Alice cannot read the blobs inside a container. To read the blobs, Alice would have to retrieve the storage access keys and use them to access the blobs. 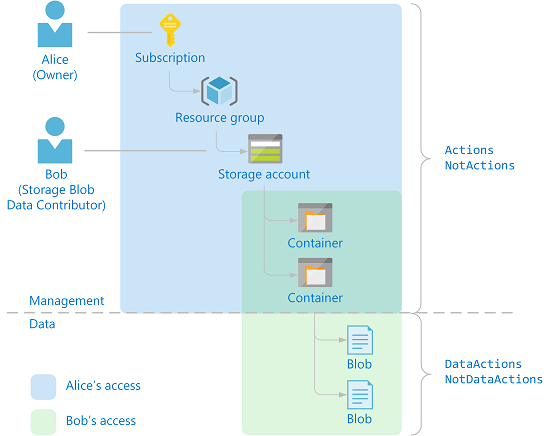 Bob's permissions are restricted to just the Actions and DataActions specified in the Storage Blob Data Contributor role. Based on the role, Bob can perform both management and data operations. For example, Bob can read, write, and delete containers in the specified storage account and he can also read, write, and delete the blobs. For more information about management and data plane security for storage, see the Azure Storage security guide. What tools support using RBAC for data operations? The Azure portal also allows users to browse and manage the contents of Queues and Blob containers via the Azure AD preview experience. 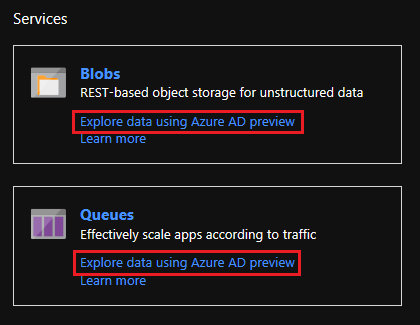 To see and manage the contents of a Queue or Blob container click the Explore data using Azure AD preview on the storage account Overview. The Actions permission specifies the management operations that the role allows to be performed. It is a collection of operation strings that identify securable operations of Azure resource providers. Here are some examples of management operations that can be used in Actions. */read Grants access to read operations for all resource types of all Azure resource providers. Microsoft.Compute/* Grants access to all operations for all resource types in the Microsoft.Compute resource provider. Microsoft.Network/*/read Grants access to read operations for all resource types in the Microsoft.Network resource provider. Microsoft.Compute/virtualMachines/* Grants access to all operations of virtual machines and its child resource types. microsoft.web/sites/restart/Action Grants access to restart a web app. The NotActions permission specifies the management operations that are excluded from the allowed Actions. Use the NotActions permission if the set of operations that you want to allow is more easily defined by excluding restricted operations. The access granted by a role (effective permissions) is computed by subtracting the NotActions operations from the Actions operations. If a user is assigned a role that excludes an operation in NotActions, and is assigned a second role that grants access to the same operation, the user is allowed to perform that operation. NotActions is not a deny rule – it is simply a convenient way to create a set of allowed operations when specific operations need to be excluded. The DataActions permission specifies the data operations that the role allows to be performed to your data within that object. For example, if a user has read blob data access to a storage account, then they can read the blobs within that storage account. Here are some examples of data operations that can be used in DataActions. Microsoft.Storage/storageAccounts/ blobServices/containers/blobs/read Returns a blob or a list of blobs. Microsoft.Storage/storageAccounts/ blobServices/containers/blobs/write Returns the result of writing a blob. Microsoft.Storage/storageAccounts/ queueServices/queues/messages/read Returns a message. Microsoft.Storage/storageAccounts/ queueServices/queues/messages/* Returns a message or the result of writing or deleting a message. The NotDataActions permission specifies the data operations that are excluded from the allowed DataActions. The access granted by a role (effective permissions) is computed by subtracting the NotDataActions operations from the DataActions operations. Each resource provider provides its respective set of APIs to fulfill data operations. If a user is assigned a role that excludes a data operation in NotDataActions, and is assigned a second role that grants access to the same data operation, the user is allowed to perform that data operation. NotDataActions is not a deny rule – it is simply a convenient way to create a set of allowed data operations when specific data operations need to be excluded. The AssignableScopes property specifies the scopes (subscriptions, resource groups, or resources) that the role is available for assignment. You can make the role available for assignment in only the subscriptions or resource groups that require it, and not the clutter user experience for the rest of the subscriptions or resource groups. You must use at least one subscription, resource group, or resource ID. Role is available for assignment in a single subscription "/subscriptions/c276fc76-9cd4-44c9-99a7-4fd71546436e"
Role is available for assignment in two subscriptions "/subscriptions/c276fc76-9cd4-44c9-99a7-4fd71546436e", "/subscriptions/e91d47c4-76f3-4271-a796-21b4ecfe3624"
Role is available for assignment only in the Network resource group "/subscriptions/c276fc76-9cd4-44c9-99a7-4fd71546436e/resourceGroups/Network"
Role is available for assignment in all scopes "/"
For information about AssignableScopes for custom roles, see Custom roles for Azure resources.